R: [ΒAΣIΛEΩΣ] /A]NTIOXOY on right, [ΦI]ΛOMHTOPOΣ on l., Eagle stg l., BΣ underneath for SE date. 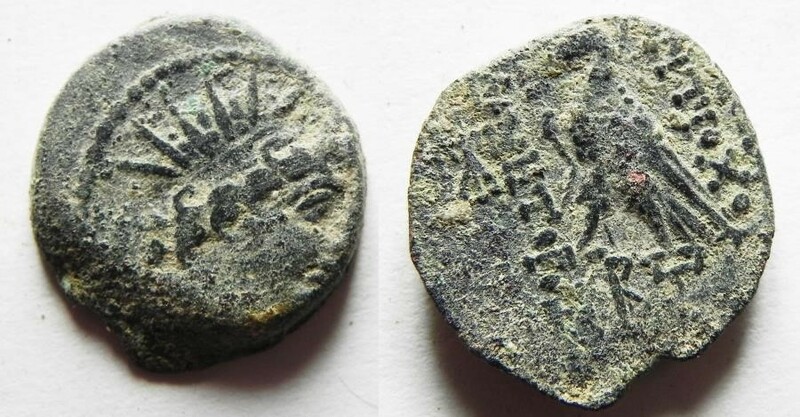 This is an example of the rare and elusive PHILOMETOR bronze of Antiochos VIII issued for a short time during SE 202. SC remarks that the epithet is used without irony despite his having killed his mother a decade before. Petr Vesely has discussed this issue and the known examples on his website found http://seleukidtraces.info/information/ni_antiochos_philometor.html. ἕνεκ[εν καὶ εὐνοίας τῆς εἰς ἑαυ]τόν. Carbo, who was Roman consul in 113 B.C., was probably acting as governor of the province of Asia when this statue was set up, but the reason that he was honoured in this way is unknown; see R.Kallet-Marx, "Hegemony to Empire", page 228 ( UC press e-books ). King [Antiochos] Epiphanes Philometor [Kallinikos, the son] of king Demetrios [and queen] Kleopatra, dedicated this statue of Gnaeus Papirius Carbo, [the son of Gaius], the praetor [and (?) proconsul of the Romans], on account of his virtue [and his goodwill towards] the king. This example is ex Zurqieh (Dubai) 2018.